, an eminent musician, born in 1728, at Bari, in the kingdom of Naples, may be ranked among the most fertile, spirited, and original composers | that the Neapolitan school has produced. His father designed him for the church, and made him study for that intent; but, for fear of his neglecting serious business for amusement, he would not let him learn music. The young man, however, having an invincible passion for that art, never saw an instrument, especially a harpsichord, without emotion, and practised in secret the opera airs which he had heard, and which he retained with surprising accuracy. His father having carried him, one day, to the bishop of Bari, he amused himself in the room, where he was left alone, with a harpsichord which he found there, thinking he could be heard by no one; but the prelate, in the next apartment, having heard him, condescended to go to the harpsichord, and obliged him to repeat many of the airs which he had been playing; and was so pleased with his performance, that he persuaded his father to send him to the conservatorio of St. Onofrio, at Naples, of which the celebrated Leo was then the principal master. 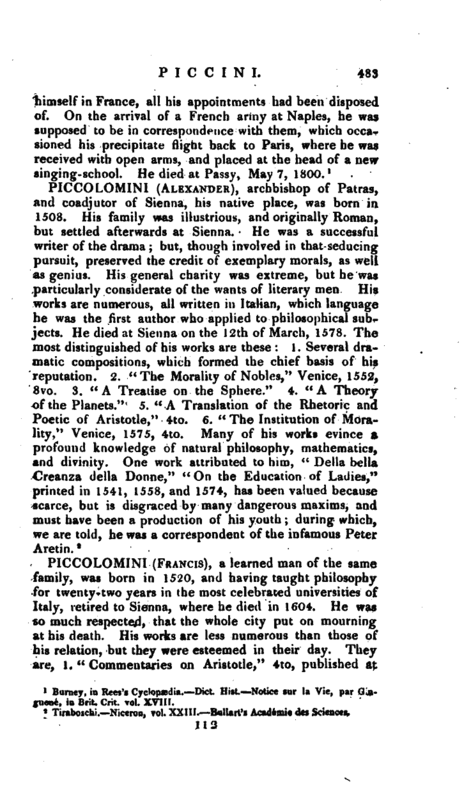 The young Piccini was admitted in that seminary in 1742, and was placed at first under the tuition of a subaltern master, whose lessons, given in a dry and contracted manner, soon disgusted him; and, in a few months, his discontent at such unprofitable instructions drew on him the resentment of his tutor, expressed in no very gentle way. Shocked with this treatment, he resolved to study by himself, and began composing without rules, or any other guides than his own genius and fancy, psalms, oratorios, and opera airs; which soon excited the envy or admiration of all his fellow-students. He even had the courage to compose an entire mass. One of the masters who had seen it, and even permitted him to have it rehearsed, thought it right to mention it to Leo; who, a few days after, sent for Piccini, who, frightened at this message, obeyed the order with fear and trembling. “You have composed a mass,” said Leo, with a cold and almost severe countenance. “Yes, sir.” “Shew me your score.” “Sir, sir,” “Shew it me, I say.” Piccini thought himself ruined, but he must obey. He fetched his score at which Leo looked, turned over the leaves, examined each movement, smiled, rung the bell, as the signal for a rehearsal. The young composer, more dead than alive, begged in vain to be spared what he thought such an affront. The singers and instrumental performers obeyed the summons: the parts were distributed, and the performers waited only | for Leo to beat the time. When, turning gravely to Piccini, he presented him the baton, which was then used every where, in the performance of full pieces. Piccini, put to new confusion, wished he had never dared to meddle with composition; but at length rnustere 1 his courage, and marked with a trembling hand the first bars. 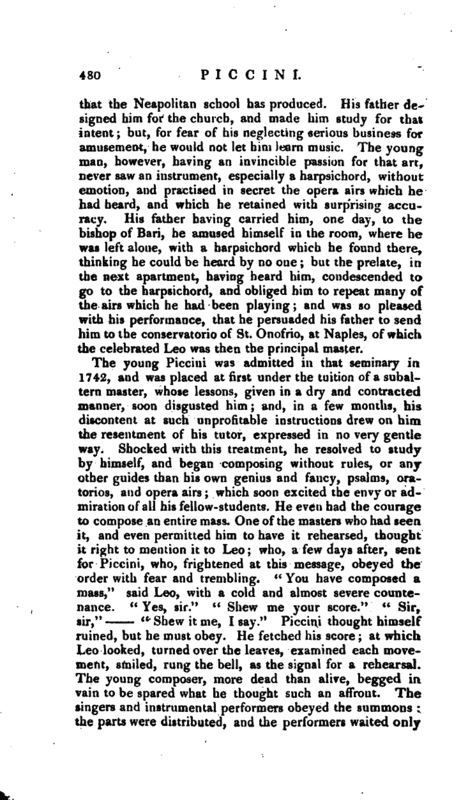 Soon, however, animated and infl imed by the harmony, he neither saw Leo nor the standers by, who were numerous: he was absorbed in his music, and directed its performance with a fire, energy, and accuracy, which astonished the whole audience, and acquired him great applause. Leo kept a profound silence during the performance. When, it was over “I forgive you, for once,” said he; “but if you are again guilty of such presumption, you shall be punished in such a manner as you will remember as long as you live. What! you have received from nature so estimable a disposition for study, and you lose all the advantages of so precious a gift! 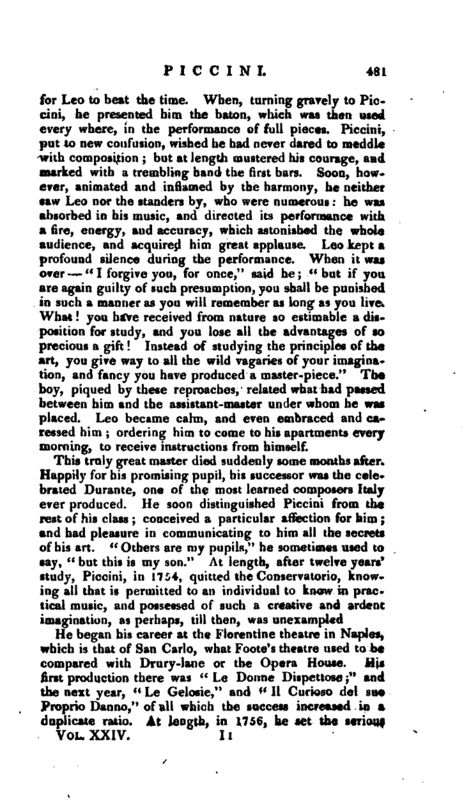 Instead of studying the principles of the art, you give way to all the wild vagaries of your imagination, and fancy you have produced a master-piece.” The boy, piqued by these reproaches, related what had passed between him and the assistant-master under whom he was placed. Leo became calm, and even embraced and caressed him; ordering him to come to his apartments every morning, to receive instructions from himself. He began his career at the Florentine theatre in Naples, which is that of San Carlo, what Foote’s theatre used to be compared with Drury-Jane or the Opera House. His first production there was “Le Donne Dispettose;” and the next year, “Le Gelosie,” and “II Curioso del suo Proprio Danno,” of all which the success increased in a duplicate ratio. At length, in 1756, he set the serious | opera of “Zenobia” for the great theatre of San Carlo, which was crowned with still greater success than his comic operas. 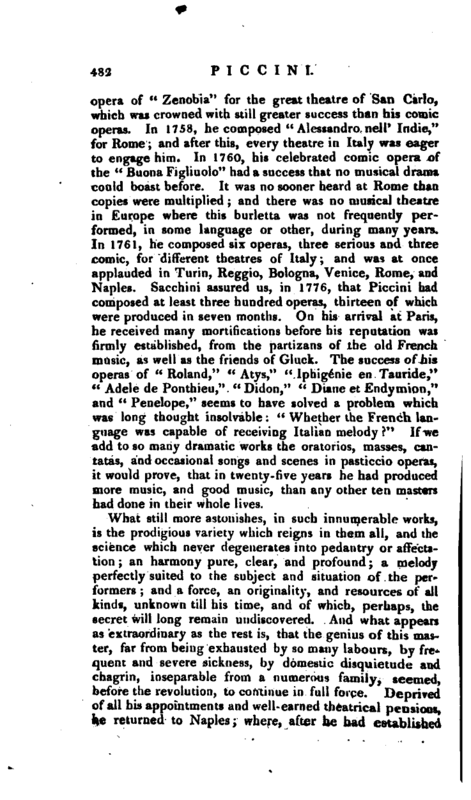 In 1758, he composed “Alessandro nell‘ Indie,” for Rome; and after this, every theatre in Italy was eager to engage him. In 1760, his celebrated comic opera of the “Bnona Figliuolo” had a success that no musical drama could boast before. It was no sooner heard at Rome than copies were multiplied; and there was no musical theatre in Europe where this burletta was not frequently performed, in some language or other, during many years. In 1761, he composed six operas, three serious and three comic, for different theatres of Italy; and was at once applauded in Turin, Reggio, Bologna, Venice, Rome, and Naples. Sacchini assured us, in 1776, that Piccini had composed at least three hundred operas, thirteen of which were produced in seven months. On his arrival at Paris, he received many mortifications before hrs reputation was firmly established, from the partizans of the old French music, as well as the friends of Gluck. The success of his operas of “Roland,’ 1” Atys,“” IphigSnie en Tauride,“”Adele de Ponthieu,“” Didon,“” Diane et Endymion,“and” Penelope,“seems to have solved a problem which was long thought insolvable:” Whether the French language was capable of receiving Italian melody?" If we add to so many dramatic works the oratorios, masses, cantatas, and occasional songs and scenes in pasticcio operas, it would prove, that in twenty-five years he had produced more music, and good music, than any other ten masters had done in their whcJe lives. 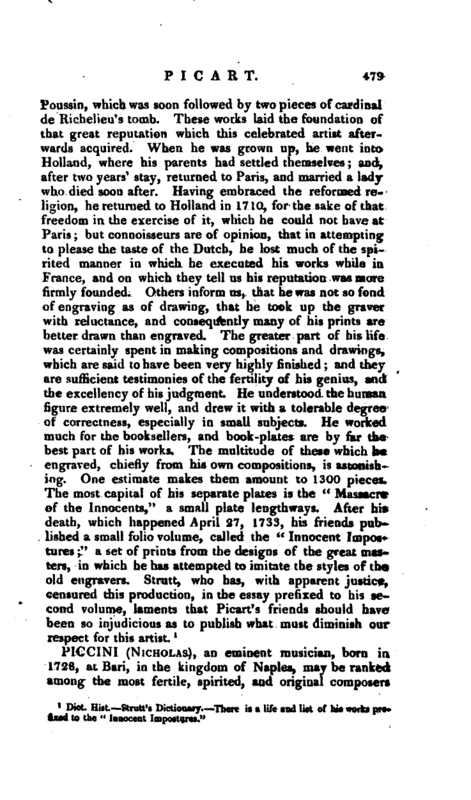 Burney, in Rees’s Cyclopædia. —Dict. Hist. Notice sur la Vie, par G!n guene, in Brit. Crit. vol. XV I If.